“Haiku”, a short Japanese poetry form, consisting of patterns of 5+ 7+ 5=17 syllables, incorporating “Kigo”- the symbolic word that represent the season. We can develop further in the interpretation. It is also free to make your own interpretation, imagination, as the same way to appreciate works of art. What Haiku brings us? - the answer is the union with nature and universe. 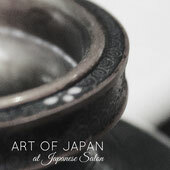 Japanese traditional cultural rituals such as Tea ceremony is the ultimate form and discipline to create the union with the nature, objects and ourselves, as "Nature is our Master". To unite with nature, humbly follow the law of nature - it is deep rooted in our Japanese DNA. With Haiku, we express what we see in a natural, simple, minimal, direct way, without a judgement - things as it is. It brings profound interpretation to each reader, leaving space for imagination. First we select a word what we see, select the suitable "kigo" the symbol of the season and combine them with stillness and movement. 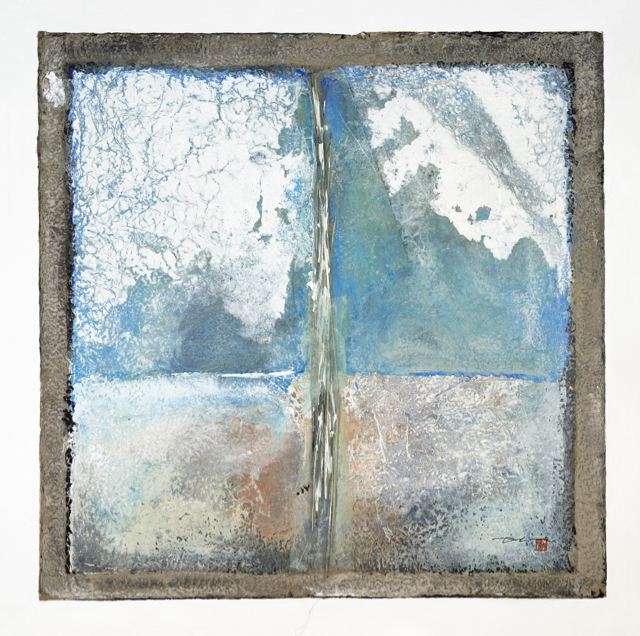 In this process we connect ourselves with the nature, object and with the universe, in a similar way as we practice tea ceremony, or making art.
" 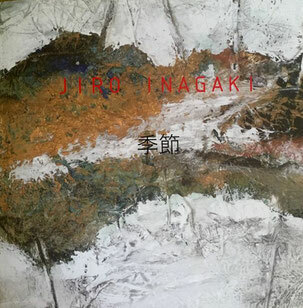 Nature is my master"
Jiro Inagaki (1933-2008), Japanese Artist said to his fellow Dutch Artist, Ad Arma. Ad warmly recalls his time with Jiro san and what he shared and learned from him. Ad continue to his master. Every day, take some moments to breath, feel the air, feel the rain, feel the wind, feel the sun, light and shadow. Acknowledge them, embrace them. Embrace ourselves, our rainy day, our sunny day. 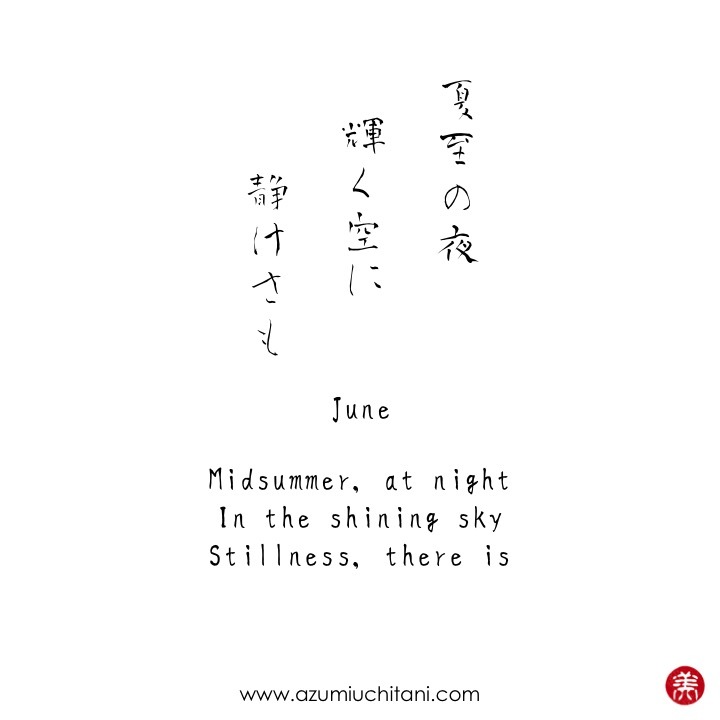 In Japan, June is the month with gentle rain falls with humidity, a rather sluggish feel, called Tsuyu season, Ajisai (Hydrangea) blooming in the rain, with a little snail on its leaf. This is the month in-between the fresh green of May, and the striking blue under hot strong sun of July. Here in Europe, the darkness of winer fades away and the sun starts lighting us up, bringing a feel of optimism, every day. We celebrate and welcome the sunshine and enjoy the long evening under the bright sky till the night falls. See the sky on the midsummer day, shining so long, however, there is a mystic stillness. On the day of midsummer -summer solstice, observe the sky as the longest day ends. Perhaps, we may capture the stillness in the sky, like this art. The most important thing is to create a simple moment(s) to pay attention, raise your awareness and consciousness and connect with your surroundings and nature. Make it your routine to feel the bliss- your Haiku Moment - be in the NOW, purely see thing as it is, as you are. Would you like to learn more about Haiku and mindfulness through Japanese culture?